It’s not unusual for children — especially those in their “terrible twos” and early teens — to defy authority every now and then. They may express their defiance by arguing, disobeying, or talking back to their parents, teachers, or other adults. 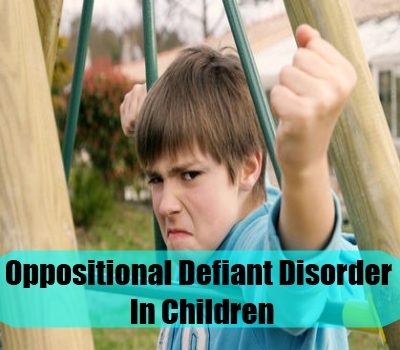 When this behavior lasts longer than six months and is excessive compared to what is usual for the child’s age, it may mean that the child has a type of behavior disorder called oppositional defiant disorder(ODD). ODD is a condition in which a child displays an ongoing pattern of an angry or irritable mood, defiant or argumentative behavior, and vindictiveness toward people in authority. The child’s behavior often disrupts the child’s normal daily activities, including activities within the family and at school. If the doctor cannot find a physical cause for the symptoms, he or she will likely refer the child to a child and adolescent psychiatrist or psychologist, mental health professionals who are specially trained to diagnose and treat mental illnesses in children and teens. Psychiatrists and psychologists use specially designed interview and assessment tools to evaluate a child for a mental illness. The doctor bases his or her diagnosis on reports of the child’s symptoms and his or her observation of the child’s attitude and behavior. The doctor often must rely on reports from the child’s parents, teachers, and other adults because children often have trouble explaining their problems or understanding their symptoms. Psychotherapy : Psychotherapy (a type of counseling) is aimed at helping the child develop more effective coping and problem-solving skills, and ways to express and control anger. A type of therapy called cognitive-behavioral therapy aims to reshape the child’s thinking (cognition) to improve behavior. Family therapy may be used to help improve family interactions and communication among family members. A specialized therapy technique called parent management training (PMT) teaches parents ways to positively alter their child’s behavior. Behavior management plans also often involve developing contracts between parent and child that identify rewards for positive behaviors and consequences (punishments) for negative behaviors. Medication : While there is no medication that is scientifically established or formally approved to treat ODD, drugs may sometimes be used to treat other mental illnesses that may be present, such as ADHD or depression.